OP3270. 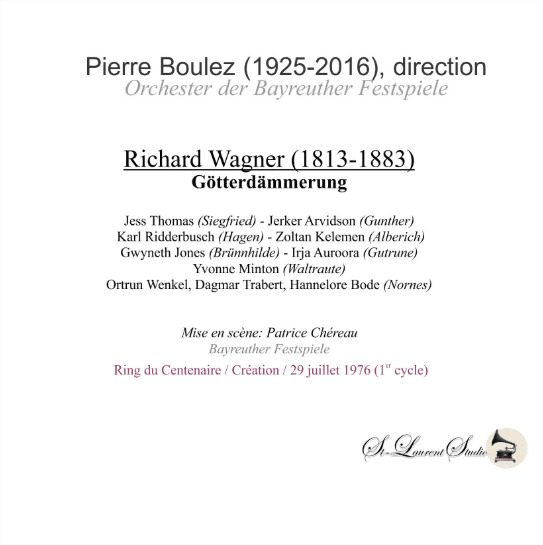 GOTTERDAMMERUNG, Live Performance, 29 July, 1976, w.Boulez Cond. Bayreuth Festival Ensemble; Gwyneth Jones, Jess Thomas, Jecker Arvidson, Karl Ridderbusch, Zoltan Kelemen, Irja Auroora, Yvonne Minton, etc. [The final day of the First Cycle - a far superior version than the later performance already available on Video, these CDs [not DVDs] are in breathtakingly brilliant stereo sound! This electrifying performance is unforgettable; with not one weak link in the superb cast, you'll never hear Jones and Thomas in more glorious form!] [Regarding this performance, note the fascinating BOULEZ IN BAYREUTH book, B0058] (Canada) 4-St Laurent Studio YSL T-723. Transfers by Yves St Laurent. 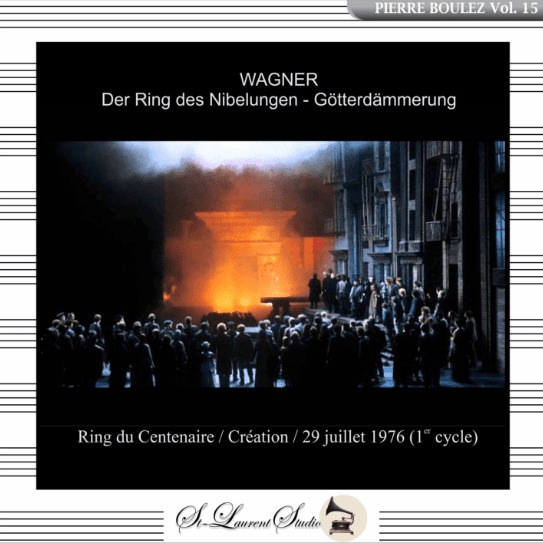 "As a member of the audience at the first performance of the Boulez RING in 1976, I can attest that this performance is clearly superior to the DVD version from three years later....the freshness of the performance and Boulez's conducting remain an unexpected marvel. What a 'find'." 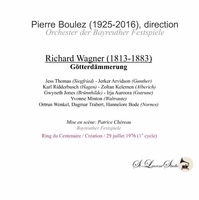 "Boulez's ultimate achievement as a recording artist is the video of the RING, filmed in Bayreuth, in which his lithe conducting provides the perfect counterweight to Chereau's convulsive directorial vision to become available on home video on VHS tape and on LaserDisc, as well as being released on Philips LPs and compact discs. [The now-offered performance is a CD presentation of the earlier performance.]" "Dame Gwyneth Jones has achieved remarkable success throughout her vocal career. Best known for her performances of Turandot and the role of Brunnhilde, she has brought an attractive stage presence, total musicianship, a highly controlled voice, and thorough emotional and dramatic involvement to all of her appearances. Gwyneth Jones was born in Pontnewynydd, Wales; her professional debut, as a mezzo-soprano, was the role of Annina in DER ROSENKAVALIER with the Zurich Opera in 1962. Shortly afterwards, she noticed her voice moving upward, which allowed her to sing the role of Amelia in UN BALLO IN MASCHERA. She was also heard singing Lady Macbeth for the Welsh National Opera and the Royal Opera, and heard filling in for Leontyne Price and Regine Crespin at Covent Garden. After performing roles such as Santuzza, Desdemona, Donna Anna, Aida, and Tosca, she made appearances at the Vienna State Opera, La Scala, and at principal opera houses in Berlin, Paris, Hamburg, and Rome. Shortly after Jones made her 1966 American (New York) debut as the title role in Cherubini's MEDEA, she married Till Haberfeld, a director, with whom she had one child. She achieved American success with her performance of Fidelio with the San Francisco Opera and for her Metropolitan Opera debut as Sieglinde in DIE WALKURE on 26 November. One of Jones' greatest achievements was doing all three Brunnhilde roles in the summer of 1976 at the Bayreuth centennial RING Cycle under Pierre Boulez and Patrice Chereau. Jones entered a new phase of her career when at the 1984 Los Angeles Olympics, she gave her first performance of Turandot, a role she had learned from her former teacher Dame Eva Turner. This feat was regarded as one of the greatest triumphs of the later portion of Jones' career, during which she became known as the world's finest interpreter of this role. She also took on the roles of Minnie in LA FANCIULLA DEL WEST, the widow Begbick in MAHAGONNY, and the mother in HANSEL UND GRETEL. Jones continued the same energetic performance schedule she began early in her career well into her sixties; in 1999 she had 70 opera and concert performances planned. She was made a Dame of the British Empire, received the German Cross of Merit, and is a Kammersängerin of both the Vienna and Bavarian Operas." “Jess Thomas, an operatic tenor best known for his interpretation of Wagnerian roles, was born in 1927 in Hot Springs, S.D. He studied child psychology at Stanford University before taking up a full-time operatic career in the 1950s. After making his debut with the San Francisco Opera in 1957, he spent several years in Europe, singing Parsifal at Bayreuth in 1961. He made his Metropolitan Opera debut in 1962 as Walther in DIE MEISTERSINGER. At first he sang lyric roles as well as the heavier Wagnerian repertory, but he increasingly made Wagner his specialty through the 1960s and 70s. Although some critics felt he strained his voice with the Heldentenor roles, his interpretations nevertheless drew high praise. Harold C. Schonberg, writing in THE NEW YORK TIMES in 1974, singled out his ‘clear, intelligent, smooth singing, sympathetic acting, stylish musicianship’. Among Mr. Thomas' major achievements was a stirring Tristan, a role he performed in the late 1960s and early 70s. He was one of the few tenors who could hold his own against the formidable Isolde of Birgit Nilsson. What he lacked in sheer power he made up for with poetic intensity. ‘One must forfeit ego to communicate ideas’, he said in an interview in 1971. ‘Studying Wagner roles is like peeling an onion. Beneath the first layer is another and another until you reach the center, then – infinity’. "Zoltan Kelemen was a Hungarian bass-baritone who made his debut as Kecal in Smetana's BARTERED BRIDE in 1959. He began studying music at the Franz Liszt Academy of Music before leaving Hungary in order to study in Rome. When he left Rome in 1959, he established himself in Germany, first in Augsburg and later in Cologne. In the late 1960s and early 1970s, Kelemen was a favorite singer of Herbert von Karajan, with whom he recorded FIDELIO in the role of Don Pizarro, DER RING DES NIBELUNGEN as Alberich, BORIS GODUNOV as Rangoni, DIE MEISTERSINGER as Fritz Kothner, THE MERRY WIDOW as Mirko Zeta, and others. Kelemen also recorded the role of Klingsor in PARSIFAL with Georg Solti (1971). At the Bayreuth Festival, Kelemen succeeded Gustav Neidlinger in the role of Alberich, in which he debuted in 1964 and with which he became identified. He notably sang it several times under the direction of Pierre Boulez."